Working on a new mechanic that I may pursue: objects that stay in screen space. Right now I'm just trying it in the normal mode, but I do want to try it in the split screen mode as well. The nice thing with this is that it's pretty flexible. It could be a ground piece in screen space, or a death trigger. It can also be any size and anywhere on the screen. It was as simple as parenting the object to the camera, it turned out to be way easier to implement than I expected. Not sure how to contextualize it, but the latest playtester enjoyed it, so I'm going to make some more levels with it and pursue it further. Today I made some changes after doing a playtest session. The latest playtester enjoyed the game quite a bit, I'm feeling pretty good about the game right now! I also worked on a random idea I came up with today: objects that toggle on and off each time the player screen wraps. You can see an example below. It seems like it has some potential, but I'm not sure yet. I've got a level that uses it in the current build, so I'll be testing it. If it turns out to be interesting enough, I'll work on communicating the mechanic better. I plan on making the objects colored depending on which toggle group they're in (like the blue and red blocks in Mario Galaxy that toggle when you jump), and still visible, but faded, when they're toggled off. I'm a little confused about what's going on here, I think because of when the gif itself loops. What's getting toggled on? The vertical wall? Oops, yeah, I can see how it might be confusing. The vertical wall and the platforms are getting toggled off and on. I'm working on changing the visuals for this mechanic to make this more readable, I'll update on here when I get that done. Today I worked on readability of some things. First of all, I worked more on the "toggle on wrap" objects, making one set of objects red, and the other green. When toggled off, the object is a transparent rectangle, to make it clear as to what's happening. After playing around with it more, I'm not so sure that it will make for a good mechanic. I quickly found that wrapping into a large object that is toggled off will put the player inside the object, since it will be toggled back on once they wrap. I can't seem to find a good solution for it, so I'm no sure if I'll pursue it. I also worked on the particle trails that follow the player once they collect the collectibles, which act as keys. I was excited to show it off today, but for some reason my gif recorder is acting up, so I'll just list out what I did. -Trails teleport with the player when he screen wraps. This isn't that big of a deal, except for the early game when players are first figuring out what the trails are. Without this feature, the trails would frequently be off-screen for several seconds, leading the players to be able to unlock certain things without seeing that they had the collectible trails. Now that problem is solved. -Trails follow the player in a much more pleasing way. With the previous method, the trail chose a target near the player, moved to it quickly, chose a target near the player, repeat. This served it's purpose, but it looked way too frantic for a calm puzzle game. So I changed it. It had been bothering me for a while, but I wasn't sure how to make a more pleasing trail. I eventually landed on a solution: find the difference between the trail's current position and the player, multiply that by a pre-set speed, and then apply that to the trail's movement. It works pretty great! -Once a "no-wrap zone"(what the collectibles unlock) is in view, the trails will set the no-wrap zone as it's new target. So, the trails will go over to the no wrap zone instead of following the player once the player has seen the no wrap zone. I haven't tested this yet, but I think this will help a bunch since players usually take a while to figure out that the collectibles unlock the no wrap zones. Today I worked on a new hub world! For a while now, I've been thinking about story and how to relate the mechanic to the narrative. I've always found it interesting that the screen wrap mechanic only makes sense to the person watching, but not to the player character in the world. So, the narrative idea that I'm pursuing now is that the player character is being watched. This has been the idea for a while, and it's even reflected in the UI/menus, but I've been struggling with making it a core part of the game and conveying a story rather than just a random detail. So, to change that, I am working on a new hub world. The previous hub world was an abstract cube, but now I'm turning it into a surveillance room, with each monitor representing a different world. I may change the wall of monitors to be a high-tech rotating cube of monitors, so that I can mix the previous surreal cube with the real-world. One downside with this hub world is the fact that it doesn't have the "zoom out to show repeating images" reveal of the previous hub world. That's arguably one of the best parts of the game, so I'd like to keep it, I just need to figure out how to incorporate it into the story. Worked on the hub world some more today, it's still not finished but you can play through beginning to "end". I say end in quotes because I haven't implemented an actual ending yet. I implemented a system for the hub world to have different "states", so that the hub world can change over time, usually when the player beats a world. And then I implemented several different states for the hub world, with some environmental storytelling. Got the hub fully working now. It changes in some ways each time that the player returns to it, and I got the "wrap tracking" (shown in my last post) working. Also fixed some things with the collectible trails, which revealed some more design and programming issues with them. Currently, once the player has seen a "no wrap zone", a flag is turned to true permanently until the no wrap zone is destroyed. While that is true, any collectible trails collected will go over to the no wrap zone, to show that the trails are applied towards the no wrap zone. The problem with this method is that it is hard to remember how many you have collected once the no wrap zone is off screen. Also, any new ones collected will immediately go to the no wrap zone, meaning you don't get the reward of a nice-looking trail following you around. I'm going to try a different method tomorrow, where the flag will be set to false once the no wrap zone goes off screen, so the trails will go to the no wrap zone if it is on screen, but they will go back to you once the no wrap zone is off screen. Ideally, this will show the player how much progress they are making when they need that info, but will also show what those collectibles are applied to once they see the no wrap zone. This'll probably make more sense tomorrow, when I can actually show it. Here's a gif of what I was working on today/yesterday. The collectible trail goes over to the static when it's in view, but goes back to the player when it's not. Whaaaat, this is great! Love the mechanics. Did a playtest session today, so I got some good feedback and made a bunch of changes afterwards. Unfortunately those types of changes aren't usually easily shown in a devlog, so here's one thing I worked on today: more work on the collectible particle effect! It's less placeholder-y and cleaner, but I'm still trying to find a way to work the screen wrap mechanic into the particles' visuals themselves somehow. I went with squares since the color bars on the static gates are rectangle, and most of the assets involving TV/monitor visuals are more square and hard-edged. The problem with this is that the trail should be seen as a good thing by the player, but squares have hard, scary edges. To solve this problem, I went with the fade in/out on the trail ends, to sort of soften it. Recently I've been neglecting looking at the overall experience, so I took some time today to draw out the interest curve of the game, to help me see what I need to change and what I need to work on. Also spent some time organizing my task list, since indiecade and megabooth submissions are coming up, and I want to get an idea of what I need to get to Beta. I'm curious, does anyone here usually draw out interest curves for games you work on? I've always just gone with my gut, only recently started doing it. For the uninformed, what's an interest curve? Essentially, you don't want to be at 100% intensity all the time, or you tire people out and it's too overwhelming and they never get to dive deep into any one thing. You might say Call of Duty nowadays sometimes has this problem. Though the Sniper mission in CoD4 was amazing because the pacing was perfect. It went from a well-crafted stealth mission (the valley), to an intense sprint (the peak). You don't want to be at 0% all the time either, or else you will bore people. So a good curve will peak, have a valley, then a higher peak, then a valley, increasing the overall intensity over time without being a straight line with no downtime. You also want to make sure that your difficulty follows a similar type of curve. I sometimes find that the valleys of the difficulty curve line up with the peaks of the interest curve (since introducing new mechanics is usually interesting, but you want the first instance of it to be easy), but I don't know if that's a coincidence or not. Organized my task list so I can get a clear idea of what I need to get done for the upcoming submissions and for beta. 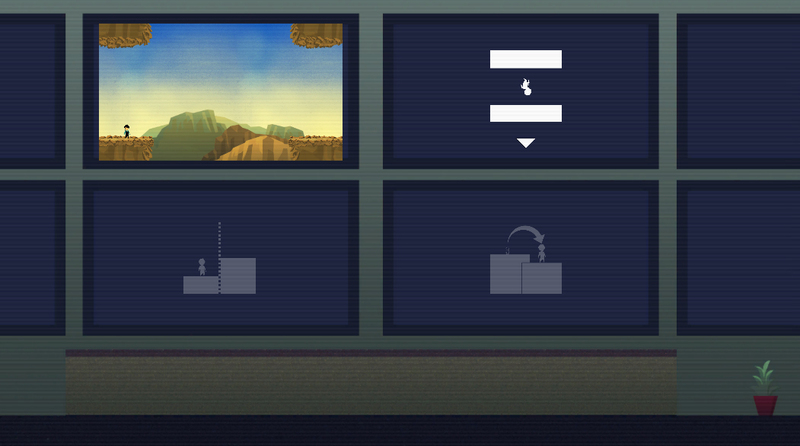 Today I mainly just cranked away on a bunch of different things on that task list, and I also made some new levels. Here's something I can show, though. I toyed with the idea of putting a light on the player, and having it wrap with the player before. But today I decided to put it into the actual game. I think it will be especially useful for learning the ceiling walk technique (wrapping into a ground piece from bottom to top, which allows you to walk on the bottom of the screen), since players sometimes are confused as to why they don't fall through the bottom of the screen in those scenarios. See the light coming through on the right side before the player does? Working on a new hub, that's sort of a combination of the latest one and something new. Haven't finished it yet, but I like the direction it's headed. Also started implementing some new sounds through Wwise, so the game's starting to sound way better! Everything is looking great. Even the placeholders are good enough for me. For the toggle walls could you collision check with the walls that are OFF but NOT the ones that are on when wrapping, so that you just become incapable of wrapping in such a way that would toggle them off? And if so does that open up any puzzles based around it? And if not did I just type up way more words than I needed to? I could, but players usually already have trouble understanding why they can't wrap when there's a wall on the other side. Having a wall that's turned off block their way would probably add even more confusion. That, and it's just not very elegant. Woohoo! Stumbled across an idea for the story. It's simple (in a good way), requires no dialog, and tells the story through the mechanics. So today I implemented some things that are needed for the story to work, and worked more on implementing sounds through Wwise. Awesome! A good story is always really hard to find, especially one that integrates the mechanics and isn't just shoved in. I've just gone with the route of being so abstract that a story is irrelevant, but I do have a narrative. I'm also starting to (finally!) work on sound in my game. Anyway, curious to see what the story is.